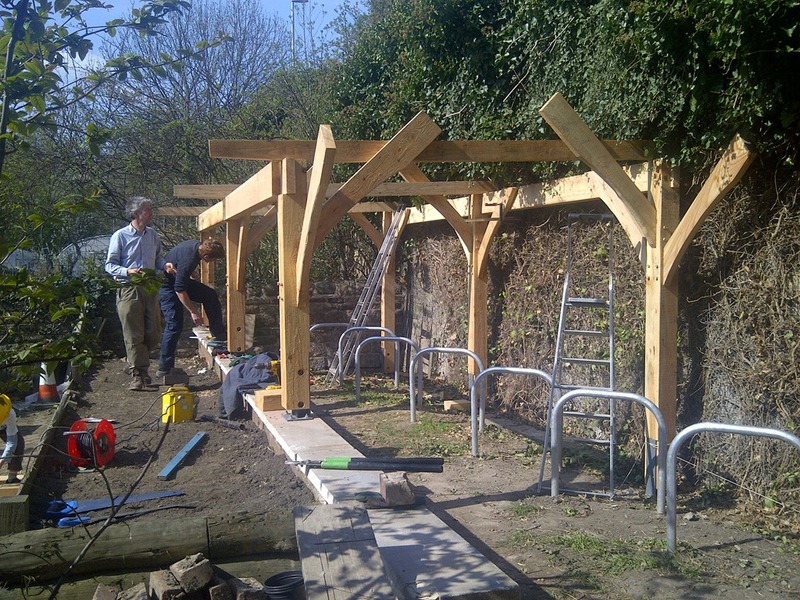 One of our activities during our last Permaculture Design Course day was to help out with the construction of a new bike shelter at Hollybush Conservation Centre, the site that the course takes place. 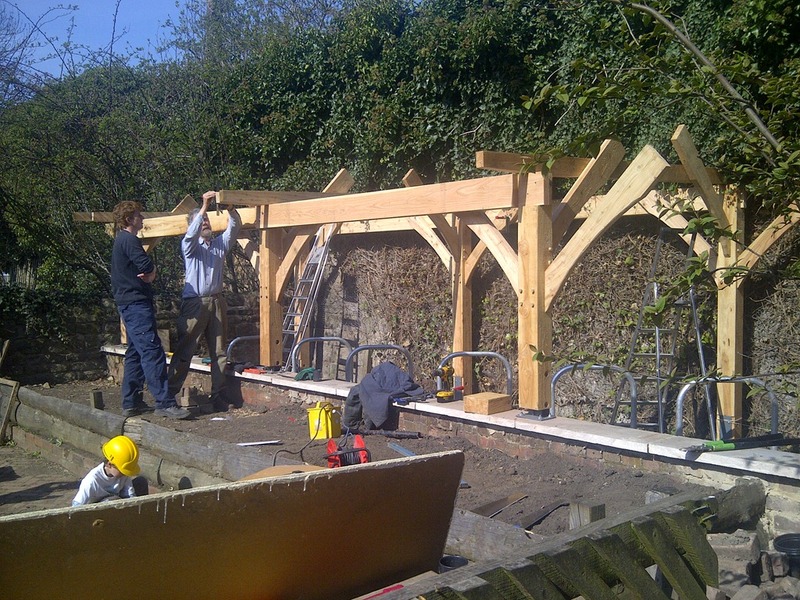 John Preston, manager of BTCV, has helped design a bike shelter built from green wood and with a green roof. Apparently building regulators specified the green roof because it is so close to the main road though it is several metres below the level of the road! Green wood is fresh, unseasoned or partly seasoned wood. One of it’s big advantages is that it is strong by being flexible rather than being stiff as in dried wood. The aim of a green woodworker is to harness this supple strength to make products that share the resilience and character of a living tree – it bends but doesn’t break! BTCV had sourced their wood from a sustainable source fairly close to Leeds. It had already been prepared and came a bit like a flat pack kit. It still needed some routing out, drilling, cutting and shaping but otherwise was almost ready to assemble. It is easier to cut green wood than dry wood, especially if you make sure that your tools are sharp! The whole structure is being assembled with a mixture of coach bolts and oak dowels. Using dowels is good because as the green wood dries out it shrinks and the joints get tighter. John pointed out to us that if you use metals you have to choose them carefully as different timbers will cause the metals to corrode in different ways – and when metals corrode they generally expand which can cause the wood to break open. One of the exciting things about this timber is that it will shrink, twist, crack and change colour. The bike shelter is going to feel like a living structure, especially once it has a green roof of sedum. I didn’t do a huge amount of work on the structure, maybe I’ll get back to give a hand finishing it off, but I came away inspired by the structure, the materials and the people. Maybe I’ll do my next project in green wood.